These are strange little tasty candies. 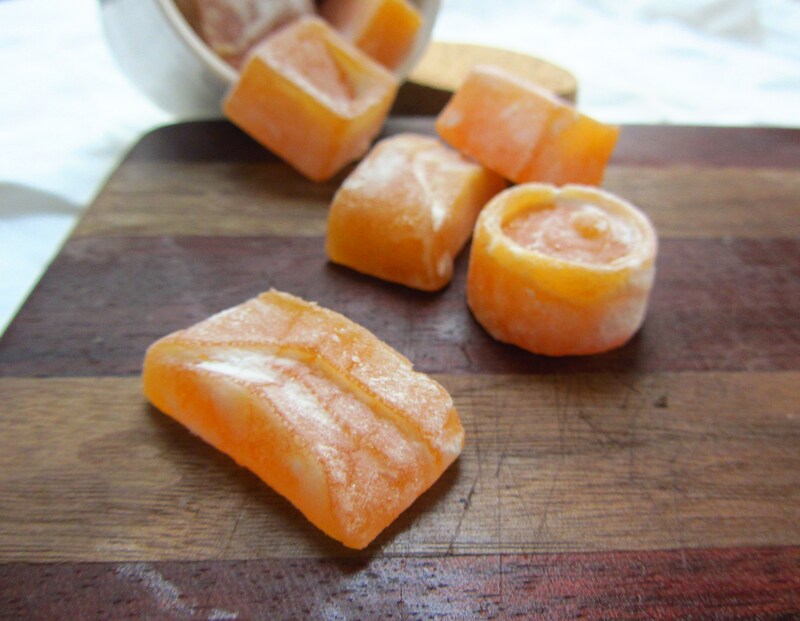 Yams are sweet to begin with, so turning them into candies makes a good deal of sense. I made a very basic version, without any spices, although I think a little cinnamon, or even a dash of maple would be a nice addition. The result is a candy that showcases all the wonderful, earthy flavors of these tasty root vegetables. The initial sweet flavor is followed by the yam, and the color is the same vibrant orange of sweet potato fries. They’re quirky, unlike anything I’ve tasted before, and have enough of a sense of “other” to be a great fictional dish! Cook’s Notes: My candies came out a tad chewy, which I liked, despite the fact I was aiming for hard candy, as per Twitter guidance from the author. Mix together the water, 2 cups sugar, and corn syrup in sauce pan and bring them to a boil. When you’ve got some nice big bubbles, add the yam puree, stir vigorously to combine, and continue heating until the mixture reaches the soft crack stage, around 280 degrees F. When it reaches that temperature, spoon or pour the mixture into the molds as fast as possible. Set aside and allow to cool 2 hours. When the candies are cool, turn them out into a pile of powdered sugar. Rub the sugar into each piece of candy, making sure that it’s fully dusted; this will help keep the candies from sticking to one another. The candies should keep in an airtight container for a couple of weeks. those look delicious! especially since i love all things sweet potato. I’ve done sweet potato with honey, and it was to die for! never thought to try it with grapes. . . will do! btw, i love this blog, and I’ve been loving the Feast of Ice and Fire cookbook!